Here's sheet music for chopin's 2nd ballade. On page 6, in the 2nd measure in the 4th line of music, there's a D# and a D natural, with two lines coming out of them and connecting to the double bar (for the sixteenth notes). I was wondering how to play this bar. I think you have to play them at the same time, but I'm not sure. Yes, that's a "play both notes". See http://musescore.org/node/14449 for a note on the standard from the US Music Publisher's Association. It's funny I saw the notation and recognized the piece right away. I can't play it very fast, but I recognized it! 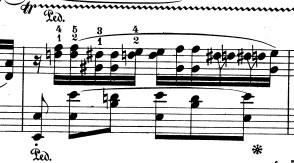 Yes, it means to play both at the same time, but that's not all you want to do with this passage. If you notice there's a phrase in there that resides on the top notes. You want to balance the right hand so the top and bottom notes sound a bit louder than inner notes. Are whole and half note rests supposed to only be written on specific lines? What is the 'head' in this song?